I woke up early this morning as I had a lot to do. It was a full day and I was looking forward to get back home and relax. On my way back home, I saw the clouds and I realized the sunset was going to paint a beautiful sky. So I put the relaxing thoughts back where they came from and rushed home, grabbed my camera and hit the road. I was racing against time, and I took a turn to Dixie Canyon, at the end of which I knew there was a trail to hike on top of a hill. Unfortunately the recent heavy rains have deteriorated the paths and there was no way to get to the top of the hill. I ran back to my car, sped thru the windy roads to get to an opening where I could see the western sky. Well, the below picture was the best view I could catch. 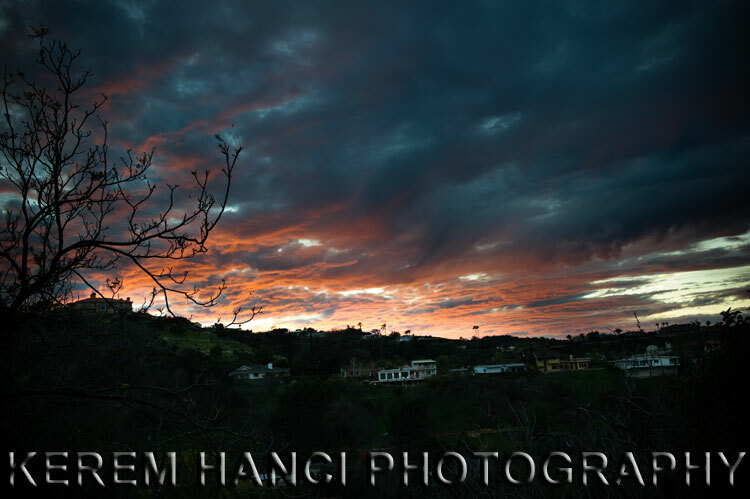 Although I found a spot on Mulholland Drive, west of Coldwater Canyon after I shot this, the sun was too low already and the sky was not as impressive as this. I incorporated the design of my sites to match and to be uniform. I still have a few tweaks to add, but I would love to know what you think of the new design. Also, by navigating the top menu, you can see much more pictures! You're a genius! This is the kind of picture worthy of an academy for best photography.